​​​​​​​​AUSTIN – Austin added 32,700 net new jobs, growth of 3.3 percent, in the 12 months ending in March 2017, making Austin the tenth fastest growing major metro. 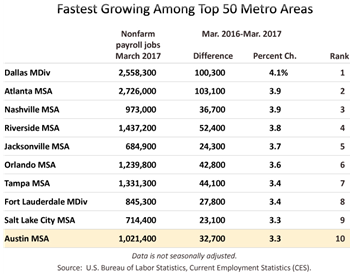 Transportation, warehousing and utilities was the fastest growing industry in the Austin MSA, increasing jobs by 6.4 percent (1,100 jobs). Over the past 12 months, education and health care added the most jobs—6,300 (5.5 percent). Austin manufacturing jobs exceeded 57,000 for the first time since August of 2014. Austin's seasonally adjusted unemployment rate is 3.6 percent, unchanged from February. The rate was 3.2 percent one year ago. The Austin metropolitan area added 32,700 net new jobs, or 3.3 percent, in the 12 months ending in March, according to Friday's releases of preliminary payroll jobs numbers by the Texas Workforce Commission (TWC) and the U.S. Bureau of Labor Statistics (BLS).